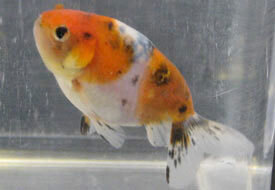 If you imagine a lionhead without the hood, a pompon without the frilly nasal septa and a celestial or bubble eye without the eye modifications, then the remnant is the same - the eggfish, its body shorter and deeper than the common goldfish and resembling the shape of an egg, hence the name. 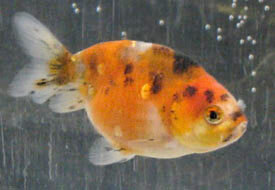 Hardly seen in the West, it is kept as a separate variety in China and Hong Kong and (see History under About Goldfish) is the precursor to the aforementioned varieties. The phoenix eggfish (also called the egg phoenix) has long, as opposed to short, tail lobes and is named for its long, fine tail after the legendary phoenix. 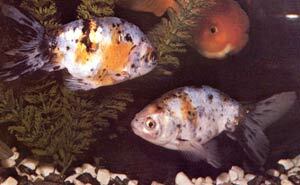 The pearlscale eggfish has domed scales as in the pearlscale. Lately the term eggfish has been extended to include long-bodied dorsal-less fish. 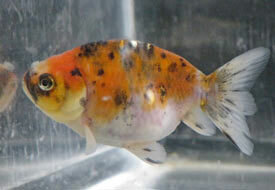 The eggfish is known as the maruko in Japan. There is as yet no British standard for the eggfish. The eggfish body and finnage are as in the pompon but without the frilly nasal septa. 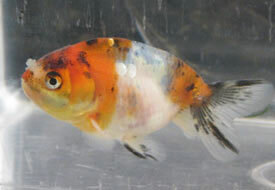 Colouration can be metallic or calico. The phoenix eggfish has long, flowing fins and a deeply forked tail. 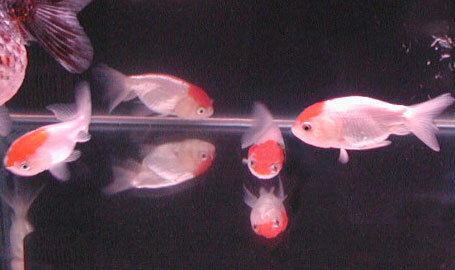 Four young eggfish, red-white metallic colouration. Photographed in Hong Kong, December 2003. Four young calico eggfish exhibited at BAS 2008; it is unusual to see such fish these days. The fish at top left and bottom right have the better body contour: deeper body and slightly smaller head in relation to the body. 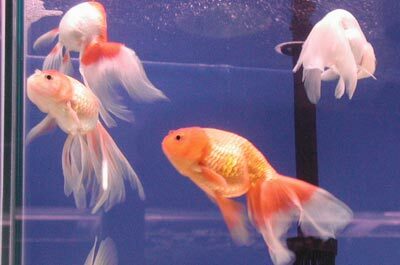 All four fish have good fantail-style finnage (short, rounded fins with the tail held up). Pair of calico eggfish. Picture courtesy of Man Shek-Hay (1982) Hong Kong Goldfish, Urban Council, Hong Kong. The tails are somewhat long for short-finned eggfish. 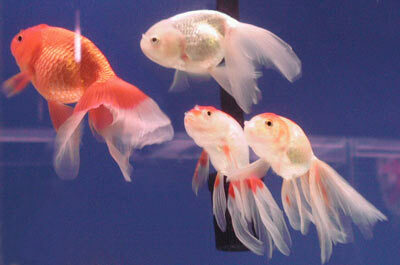 Four individuals: one red, one silver-white and two red-white variegated metallic fish. Perhaps surprisingly, there fish are strong swimmers. Two red and a red-white fish. Photographed in Hong Kong, December 2003.